I’m happy to welcome Kathy Stemke to my blog today. Besides sharing the same publisher, Guardian Angel Publishing (who published my picture book, Fantastic Flight and Kathy’s Sh Sh Sh Let the Baby Sleep), we have another interest in common. And that is Earth Day. If you’ve read my novel, Wounds (published by MuseItUp), you might recall the character Nelson Ark. He was named in honor of the founder of Earth Day, Gaylord Nelson. Kathy’s book, Trouble on Earth Day, is published by Wild Planes Press. The book was honored with the Children’s Literary Classics Seal of Approval. Trouble on Earth Day opens in the cozy home of the anthropomorphic squirrel family. The little girl squirrel, Shelby, excitedly enters with the news that her poster won the Earth Day Poster contest. The poster shows a vibrant green and blue earth on a red background. Highlighted around the earth are three examples of Rethink, Reuse, and Recycle. Shelby and Mom and Dad do some rethinking. They go through the house finding things suitable for recycling and reusing. When Shelby hears crying outside, she goes to investigate. She finds TROUBLE. A sad bluebird is homeless because someone cut down the tree his nest was in. Shelby gathers reusable items—such as cut up newspaper strips and bright pink yarn—and helps the bluebird build a new nest. They situate the beautiful new nest up high in another tree so it can be seen for miles around. With Earth Day Approaching on April 22nd it’s time to focus on educating our children about conservation. Trouble on Earth Day would be a great resource for this purpose and a super addition to any school or home library. Learning how each of us can take steps to protect our environment is important for children and adults alike. It will take all our efforts to help improve the environment for a healthier tomorrow. Trouble on Earth Day is a great start for children. Here are examples of the games and songs found in the twenty-three pages of activities in the supplement. Have the children form a circle to represent the earth, then read each statement aloud. If a statement is something good for the earth, the children jump up and down. Sleep with your lights on. Join with your friends to collect trash in the neighborhood. Throw the newspaper out every day. Turn the lights off when you leave the room. Catch rain in a bucket to water the garden. Put a bird feeder in the yard. Donate your toys to charity. Let the water run when brushing your teeth. Throw trash out of the car window. Let your helium balloons fl oat into the sky. Throw your food away when you are full. Throw your old clothes in the trash. Fill your bath tub to the top. I’m a fuzzy squirrel, black and gray. Watch me run around finding nuts today. Won’t you help me look now, far and near? I’m a happy squirrel, big and strong. Skip and jump with me, it won’t take long. We’ll have some nuts for you and for me. Another book by Kathy is Sh Sh Sh Let the Baby Sleep which is available through the publisher, http://guardianangelpublishing.com/shshsh.htm and through Amazon, B & N, and other online stores. 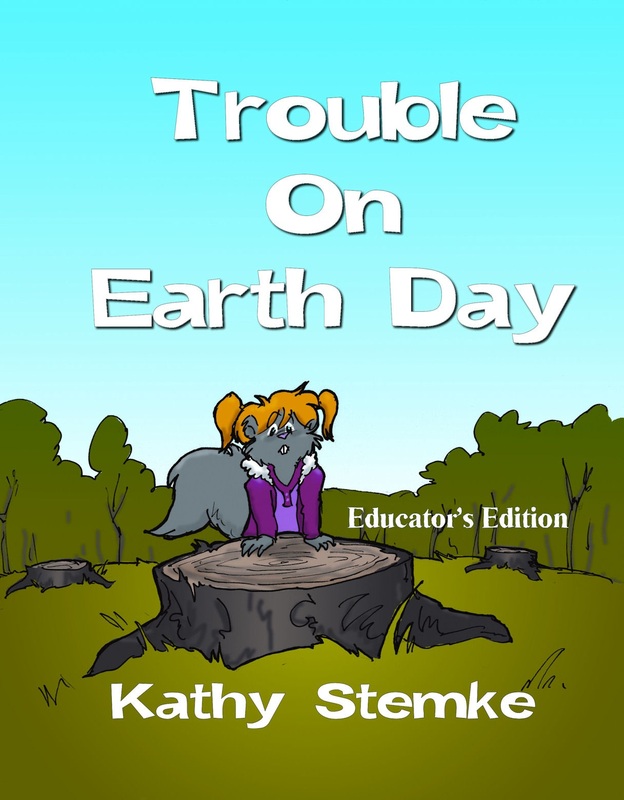 Trouble on Earth Day is available at a discounted price on Kathy’s blog: http://educationtipster.blogspot.com and through Amazon, B & N, and other online stores. I was provided with a copy of Trouble on Earth Day; my comments are given freely and honestly. You are the earliest early bird! It’s always a pleasure to see your comments. Thanks for stopping by Nancy. I’m glad we made you smile. Have a great day. Many thanks for being my guest and allowing me to spread the word about Earth Day. And congratulations on the awards! Thank You for this exciting post about Kathy’s wonderful book. Educating youngsters about important conservation factors, summed up entertainingly in the Rethink, Reuse, Recycle motif of “Trouble on Earth Day ” is a great concept. When you see the happy children performing the exercises in the book with Miss Kathy, you see a very joyous fun-filled event. Thank you for reviewing this book and bringing it to the attention of educators everywhere. Providing kids with excercises and songs are great ways to get a concept across. Kathy did a great job with this part of her book. Barbara, great review of Kathy’s book! It really is an wonderful children’s book. I agree with you; Kathy’s book is wonderful. Nice hosting job, Barbara. I think Kathy has a real hit on her hands. The classroom activity (stand up-sit down) has given me some ideas for our Troop meetings when we talk about Leave No Trace. Sounds like you’re a Scout leader, eh? How fortutious that Kathy’s book has given you some activities to do with the kids. Anthony: The kids do have fun doing the activities, don’t they? Karen: Thanks for visiting. I appreciate your support. Bill: Glad to hear I’ve spured your imagination. Hi Barbara. Wonderful review of the book. This book should be in classrooms, school libraries and children’s homes. It is important to take care of the earth, because it is the only one we have. Kathy, best wishes for a very successful tour! Thanks Susanne. It is the only Earth we have. I’m glad you enjoyed my review of this terrific book. Let’s hope teachers and librarians are looking for ways to promote Earth Day–and find this book. Kathy, it was great telling folks about your book, Trouble on Earth Day. Let me know when I can review another of your books. I’m moving Margo Dill’s comment to this page. (I made a mistake on the other one). I remember looking at this book before. It is a super book for this time of year–perfect for classrooms or home schools. Thanks for stopping by. I’m glad Kathy’s book is getting lots of exposure. Trackback: Kurtoons Online - The Squirrel Artist Speaks! You will notice we have a Trackback: a link to the cartoonist’s blog. Just click on it and visit Kurt to see how he illustrates a book. Thanks, Kurt, for pinging back.